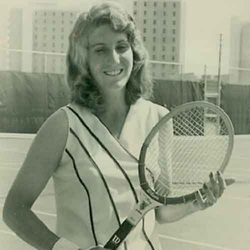 The 1973 Women's Athlete of the Year was tennis player Janet Haas who was team captain in 1972 and 1973. Janet came to the University of Miami just before Title IX mandated that athletic departments begin offering women scholarships and was the first woman tennis student-athlete to be offered a scholarship in 1973. While a member of the tennis program, she helped recruit the best tennis players in the Miami area and helped build a nationally ranked program. She was State of Florida Women's Collegiate Singles and Doubles Champion in both 1972 and 1973, and was ranked 4th nationally by the Association of Intercollegiate Athletics-Women's, the collegiate organization regulating women's college athletics before the NCAA. Janet went on to play on the Women's professional circuit and played Wimbledon, the U.S. Open, the French Open along with the Italian and German Opens and was ranked 28th best in the World in 1974. She became one of the first members of the Women's Tennis Association and served on its Board of Directors. She currently is a teaching professional at Miami Shores Country Club here in South Florida.